KJV Bible Offline is a free app which allows you to read the Bible even when offline. 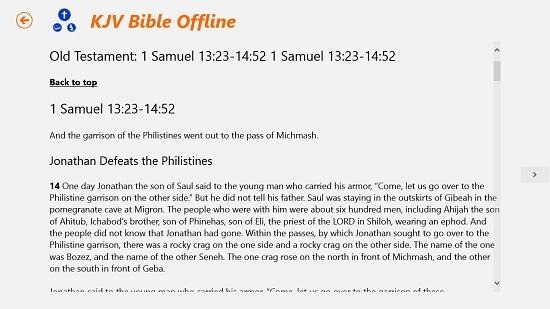 The app works well on Windows 8 and 8.1 and the best part of this app is that the app doesn’t drain a lot of battery hence being a great way to read your bible even when you don’t happen to have an active internet connection or your bible handy. 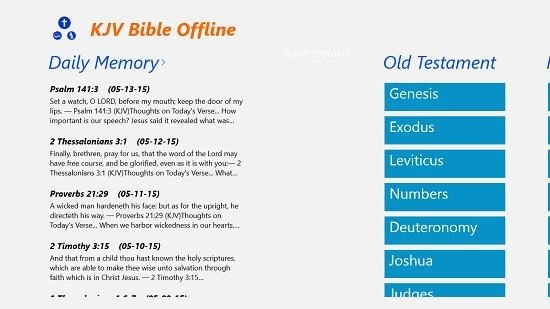 The app is very lightweight and weighs in at barely about 4Mb, and has all the components of the Bible like the Old Testament, New Testament with all sub categories. The app is very organized and allows you to easily open up any section of the bible by simply clicking on the appropriate section in the categorically sorted interface in its main screen. KJV Bible Offline is available for free from the Windows App Store. As you scroll to the right, you will be able to reveal more categories that you can access of the Bible. As is already evident from the screenshots above, the app has beautifully sorted categoric view which you can access by easily clicking on the appropriate tabs. When you click on a particular subcategory under a category, you’ll be provided with an index of the same, and clicking on an item in that index will bring you to the reader interface of the bible. This is visible in the screenshot below. You can quickly switch pages in the reader interface via the arrow buttons on either side of the screen, and you can also scroll down in a particular page to read it completely. If I were to conclude this app in a nutshell, the app makes for an excellent way to follow your Bible even when it’s not handy! 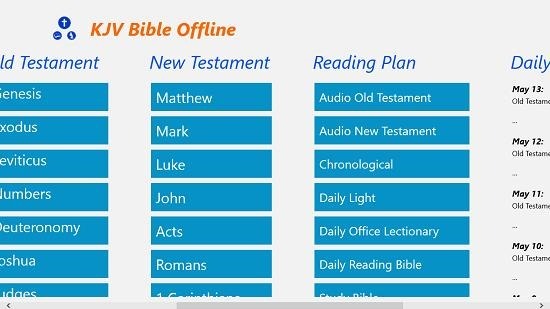 KJV Bible Offline is a well designed Bible app for Windows 8 and 8.1 which you can get for your device by heading over to the link below.